Ecuador is a small country in South America, placed on the equator. Ecuador is crossing borders with Colombia and Peru. 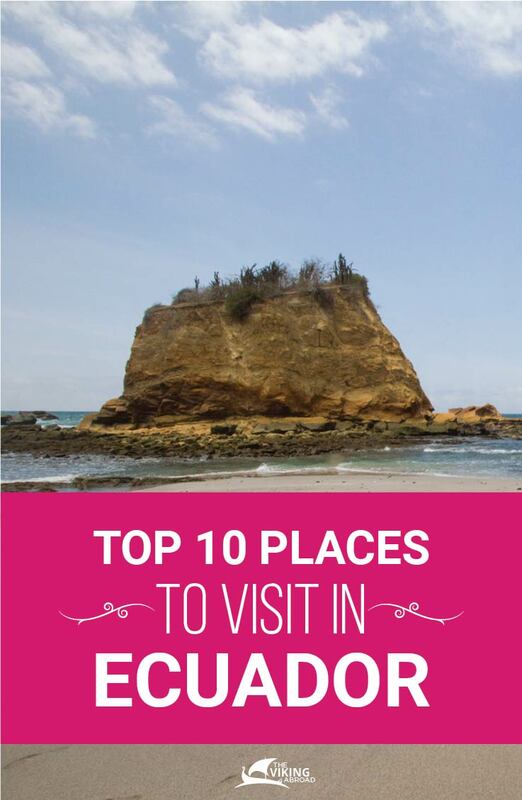 You have probably heard of The Galapagos Islands, but did you know it was a part of Ecuador? Although, The Galapagos Islands are the most visited tourist attraction in Ecuador. There is so much more to see! Even though it is a small country it has four regions: Jungle, Andes, Coast and The Galapagos. This article covers all the best places to see in those regions! The Galapagos Islands are a magical place. It is one of those places you have to visit before you die. The world heritage listed Islands are famous for its species that are not found anywhere else on the planet. This species helped Charles Darwin’s develop the Theory of Evolution. You can see the islands by boat or by land. Recommended stay is 5-7 days. Be aware that the whole Islands are a national park, no littering allowed. Where to stay in the Galapagos Islands: Hostels are not recommended because they are not eco-friendly. I recommend Chez Manany Galapagos Ecolodge, Pikaia Lodge or Red Mangrove Aventura Lodge. 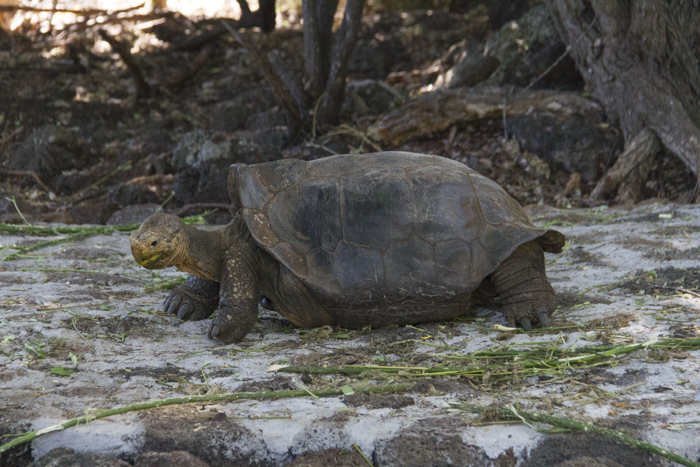 Read more about how to prepare for a trip to the Galapagos Islands. You have probably seen pictures of the swing of the end of the world. That one is in Baños. 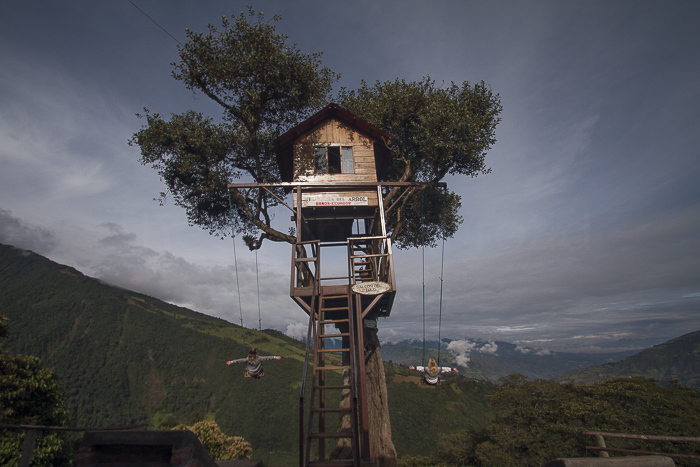 The swing is called La Casa Del Arbol and it costs $1 to enter and you can get there by bus or taxi from Baños. Hotels, Hostels and many locals would know how to get there. 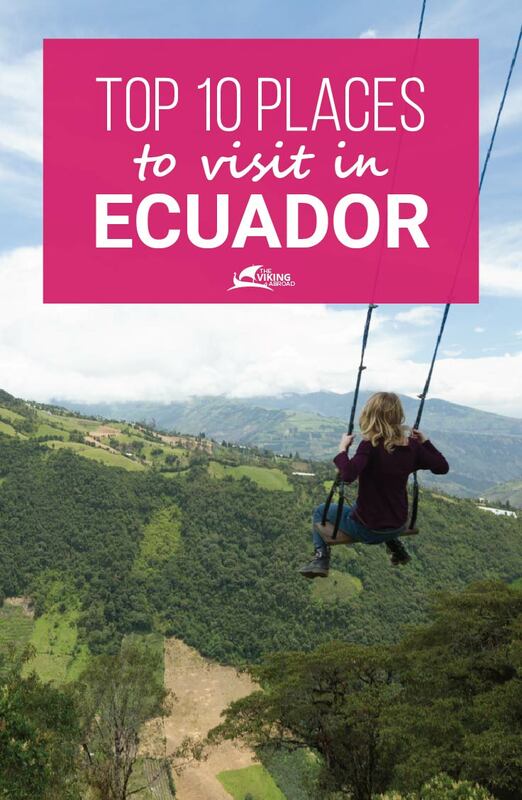 When you take the swing you might see the active volcano Tungurahua. Read more about the swing here. It is recommended to walk around Baños early in the morning. You will see how they make the delicious candy called Melcocha. Baños is also known for its beautiful waterfalls. You can do a tour with a Chiva which is an open party truck. 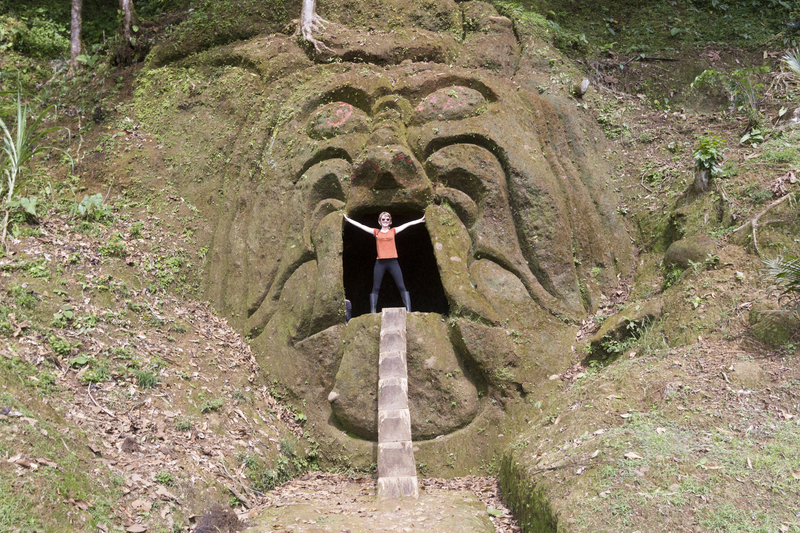 The tour is called Ruta De Las Cascadas where you can see the biggest one called Pailon Del Diablo. 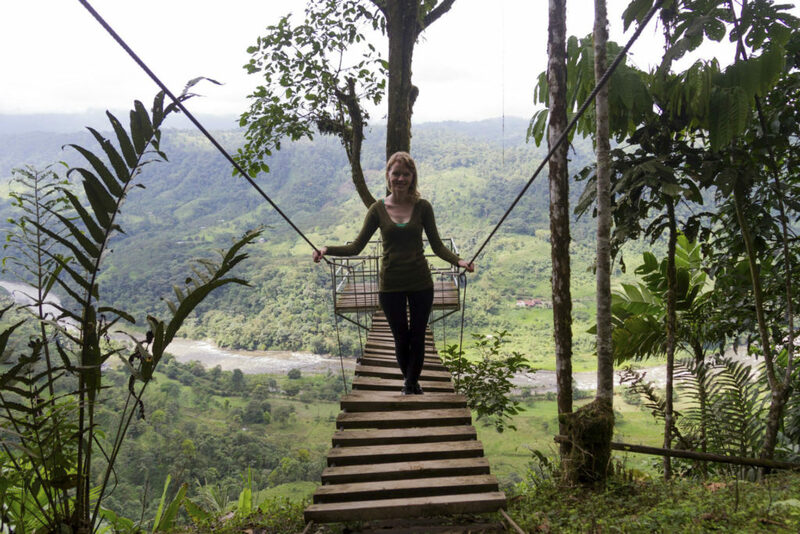 If you are a real adventurer you can also do a canopy over the river before you get to Pailon Del Diablo, there is also options to bungee jump. 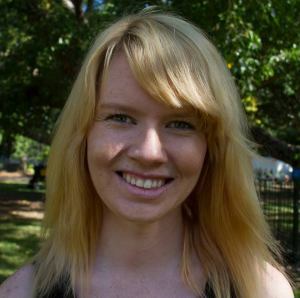 Cheap: I recommend Great hostels Backpackers, La Casa Verde or Hostal Chiminea. Luxury: Samari Spa Resort or Luna Runtun. Bus: If you travel from Quito you have to get to the bus station Quitumbe, which is in the south of Quito. It is recommended that you get to the bus station early. The buses fill up easily. You need to buy a bus ticket at the booth saying Baños. Car: If you have an internet-enabled smartphone, you should use the Waze APP and type in Baños, Tungurahua. The drive takes around 3 hours. You can also stop in the beautiful town called Ambato, where they sell amazing bread. Mindo is in the cloud forest in Ecuador. It is only two hours from Quito. 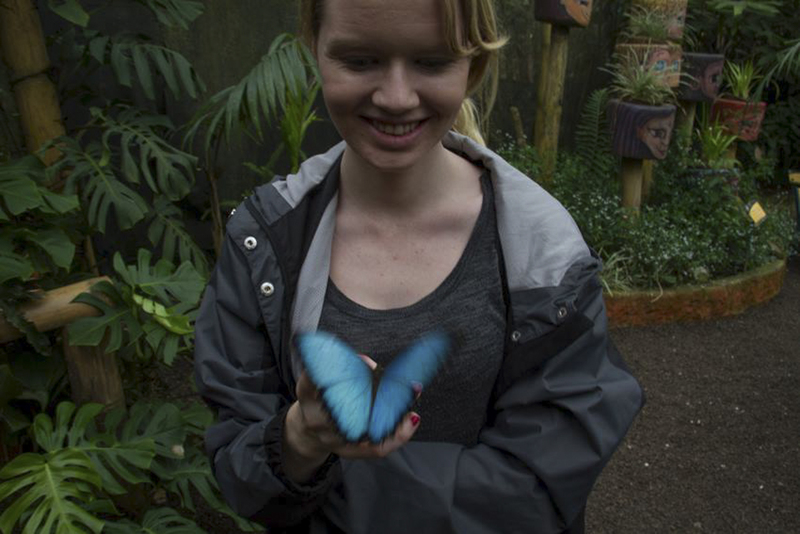 Mindo is known for its Butterflies. You can visit the butterfly reserve where you can feed the butterflies. If you are lucky, you can see the hatching. The reserve is called Mariposas De Mindo. Mindo is also known for its waterfalls which are called Nambilla Cascadas. There are two different routes you can choose from; one big waterfall or many smaller ones. Bring your swimsuit you can swim inside the waterfalls! If you love chocolate I recommend taking the chocolate tour at Elquetzal De Mindo. Other things you can do is a canopy, frog concert, orchid tour and river rafting. Since it is a cloud forest it will most likely be foggy or even rainy. Bring rain boots, rain jacket, swimsuit and mosquito repellent. Recommended stay is 1-2 days. How to get to the attractions in Mindo: Many hotels and hotels have trusted taxis or drivers that are really cheap. If you have more time I recommend to take a short trip further west to a place called Mirador Del Rio Blanco in Los Bancos, where you can have lunch or dinner with a beautiful view of the river. It is also a hotel. You can also take this latter to get the best view. See picture below. Hostel: La Casa De Cecilia, Casa De Piedra or Biohostal Mindo Cloud Forest. By car: Use Waze App by typing in Mindo, Pichincha and drive towards Mitad del Mundo and continue west towards Nanegalito. Bus: To take the bus to Mindo from Quito, you have to get to the bus station north of the city called La Ofelia. The bus stop is farther in the station and you need to buy a ticket before you go on. After the eruption in 2015, the active volcano is open again. Take the opportunity to visit one of the largest active volcanoes in the world! It is a big national park. You can walk around the national park or you can walk up the volcano to the first shelter. It is very restricted to walk up to the crater. It requires a lot of training beforehand. If you decide to walk to the first shelter, you need proper warm clothes that are waterproof. Don’t forget to use a beanie, gloves, scarf, good waterproof shoes and sunscreen. This is recommended even if you just stay around the national park. To get into the national park, you need to bring your valid id to register. It is recommended to go to Cotopaxi as early as possible. Around sunrise is perfect, where you will most likely see the whole volcano without clouds and snowstorms. 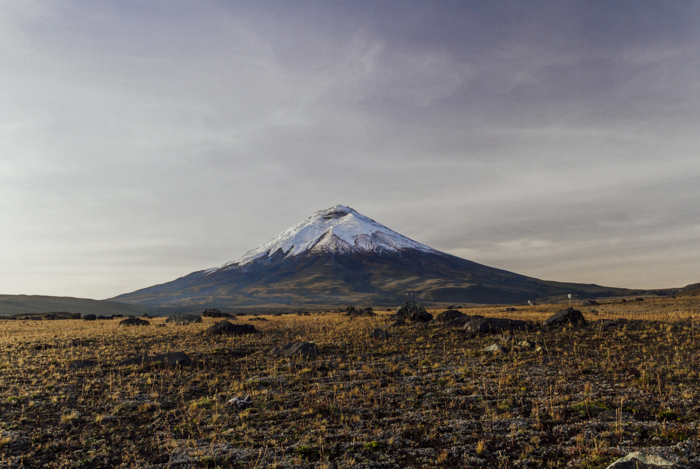 How to get there: It is recommended to drive to Cotopaxi. If you want to take a bus you have to change a bus in Latacunga. Many travel agencies offer an organised day trip where you can also bike around the national park. The best agencies are: AdoreEcuador, HappyGringo or Ecuatraveling. 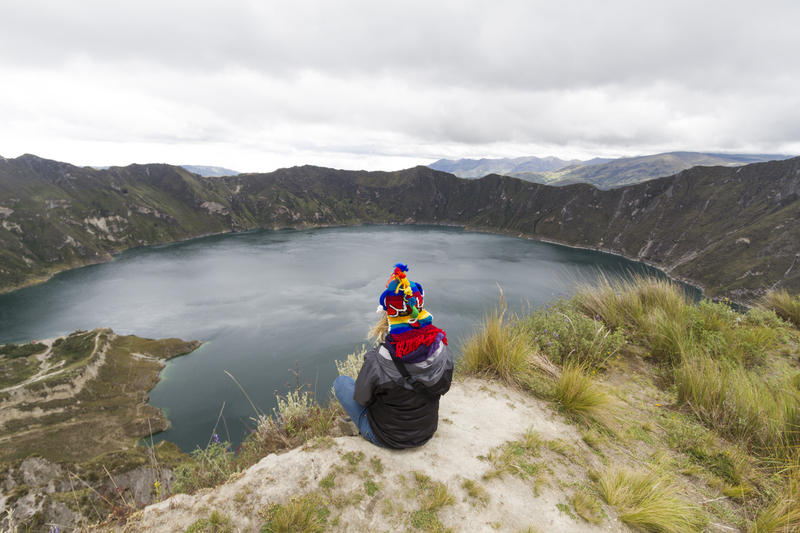 Quilotoa is maybe the most amazing natural site I have ever visited. It is absolutely stunning! It is a volcano crater with water in it! When it is blue sky, the colour of the water is unreal! You can walk down to the water or you can walk the whole loop. If you get there during the day, you can go kayaking on the crater. It is recommended to wear warm clothes, hiking boots, beanie, gloves and a scarf. I went there with friends, we brought a tent and camped near the water and had a bonfire! You don’t need to register or pay to camp! I highly recommend it. If you want to stay in a hotel/hostel they are multiple options near the entrance. I have lived in Australia and have seen many gorgeous beaches. My favourite beach is Playa Los Frailes in Manabi, Ecuador. Puerto Lopez is the part of mainland Ecuador that is the closest to Galapagos Island and you can see some similarities. There is an island few hours from Puerto Lopez called Isla De La Plata (poor man’s Galapagos.) It is a great option to Galapagos where you can see blue-footed boobies and other species. If you love diving this Island is great where you can see the unique sea life. To get on a boat to Isla De La Plata you can just walk around the pier in Puerto Lopez to spot some local travel agencies that will get you there. There is no hostels and hotels near the beach Playa Los Frailes or Isla de La Plata. The closest town is in Puerto Lopez. Best time to visit is in whale season (June to September) when you go on a boat and if you are lucky you can spot some whales. If you would like to go there for soaking up some sun, then December to April is the best time to go to Puerto Lopez. 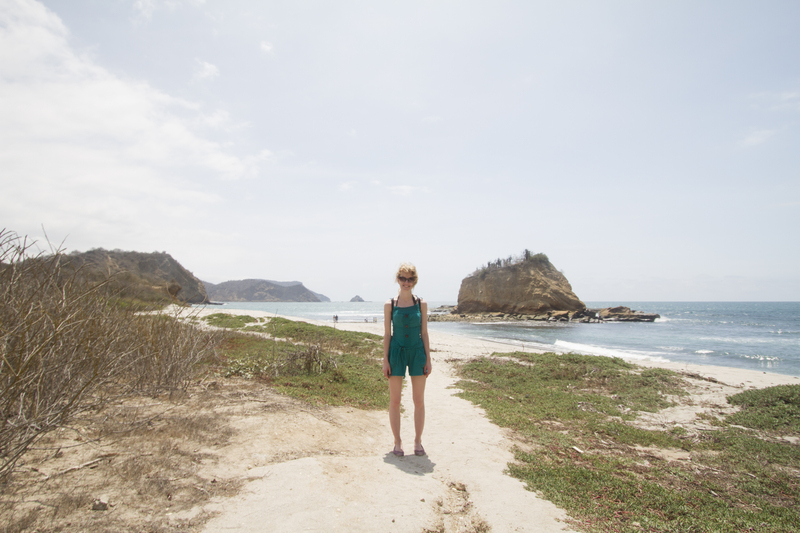 How to get to Playa Los Frailes: You need to drive or take a taxi from Puerto Lopez. How to get to Puerto Lopez: If you travel from Quito, you can take a plane to Manta and taxi from Manta to Puerto Lopez. 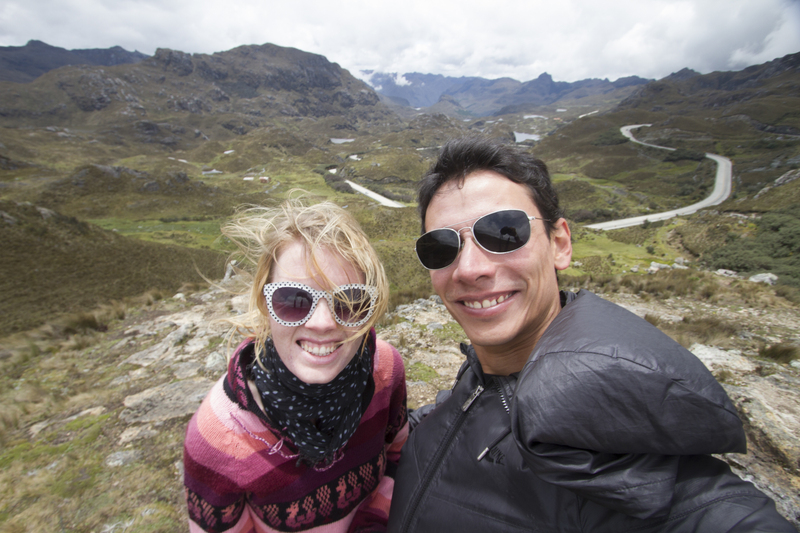 Some people drive all the way from Quito, but that will take you over 8 hours. Hosteria Mandala or Piedra del Mar hotel Boutique. Visit the popular UNESCO heritage listed city, Cuenca. Many expats decide to live or retire in Cuenca, and I understand why! People in Cuenca are very friendly and the city is absolutely beautiful. They are building a tram in Cuenca, which will be a lot easier for tourists to travel around. Cuenca has many historical sights like the Catedral de la Inmaculada Concepción and Plaza Abdón Calderón. About 20 minutes out of the city you can hike in the wonderful national park El Cajas. 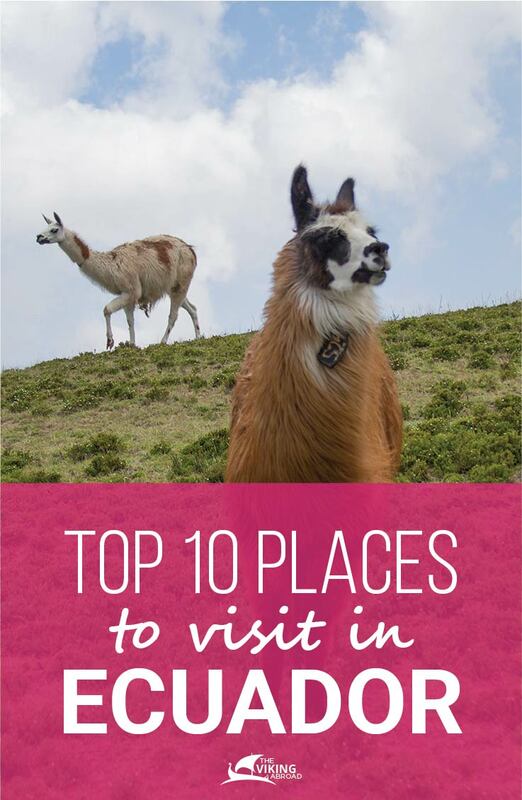 You will see a lot of lamas and alpacas. Recommended stay in El Cajas is one day. Remember to wear warm clothes including a beanie, scarf and gloves! Another sight in Cuenca is El Turi where you can see a beautiful view of the city. Recommended stay in Cuenca is 3 days. How to get to Cuenca: From Quito or Guayaquil, you can take a plane or bus. Where to stay in Cuenca: Hostal Villa del Rosario or Hotel Oro Verde. The Ecuadorian Amazon is another world! You can visit places like Cuyabeno, Yasuni, Puyo or Tena or Misahualli. The Amazon has two seasons’ wet season (December to June) and dry season (July to November.) A must to bring to the Amazon is rain-clothes, rain-boots, mosquito repellent etc. You can go there with tour companies that organise the whole trip for you. For example, Ecuatraveling where you also stay at an Eco-lodge. Recommended stay in the Amazon is 3-5 days. If you love strong colours, textiles and traditional culture – Otavalo is the place for you. 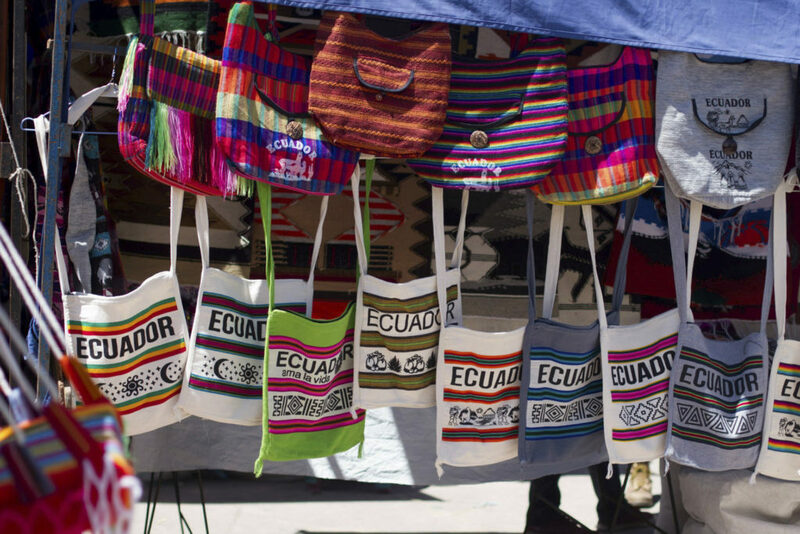 If you want to get unique hand-made souvenirs, I guarantee you will find the perfect ones in Otavalo. Recommended stay in Otavalo is one day. You can also visit the cosy town nearby: Cotacachi. You can drive, it takes roughly 2 hours. Type in Otavalo, Imbabura on Waze or Google maps. You can also take a bus from the bus stop north of Quito Carcelen. Notice you need to tell the bus driver to let you know when you are close to the market. Even though the buses are called Otavalo, it doesn’t mean that is the last stop. You should take a taxi to the bus stop Carcelen. Ecuador’s capital Quito is a must! It is recommended to visit the world heritage listed Old Town, Mitad del Mundo, Teleferiqo etc. 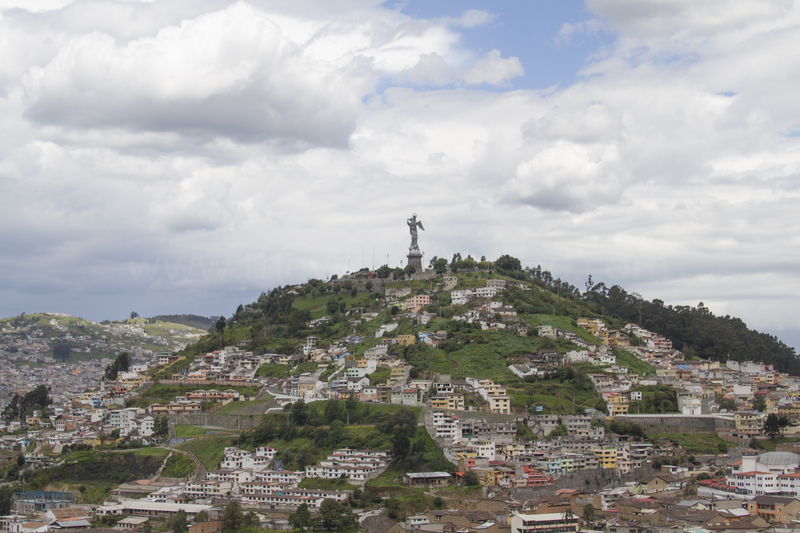 The recommended time to stay in Quito is 3-4 days. Even though Ecuador is a small country in South America, you can see experience a big variety of places. The Andes, The Galapagos, The Coast and The Amazon. 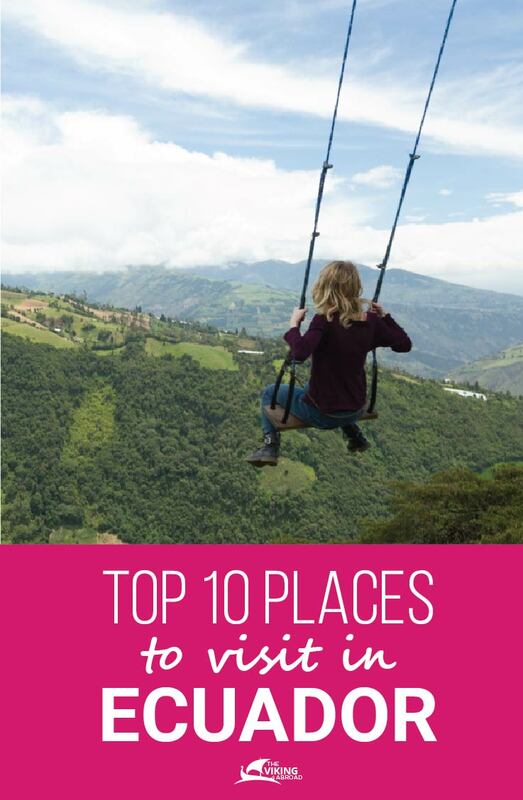 After living in Ecuador for almost three years I am confident that these ten places are a must to cover the best of Ecuador. 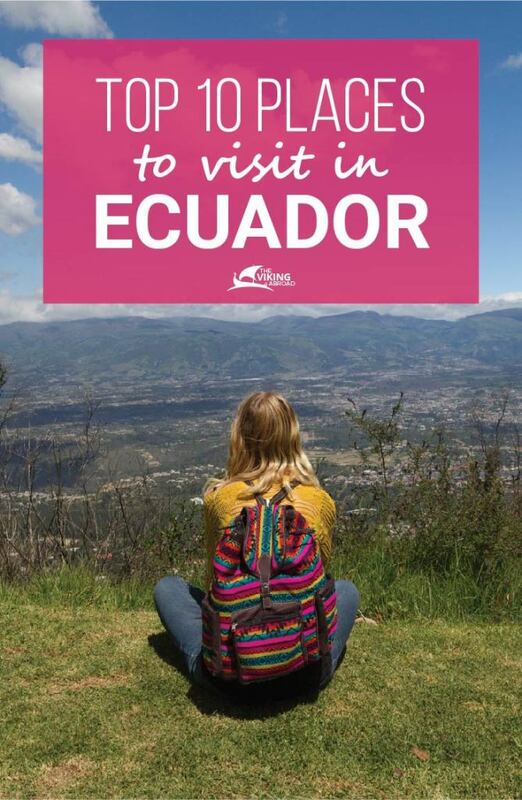 Have you been to Ecuador? Is it anything you missed in this article? Write a comment below. Amazing pictures! My sister lived there for a year and I have heard great things about traveling there. I’m in Ecuador Quito right now, after I’ve been volunteering on Galapagos for a few months. I already visited quite a lot of places, but only with day trips from Cuenca and Quito. But I am always wondering how people can see all those places in such a short amount of time. How did you get around Ecuador to all those places? So cool! I went to Ecuador for a class a few years ago, but didn’t get to do a lot of stuff. I’d love to go back! Have you rented a car in Ecuador before? I would like to rent a car and drive from Quito to Cuenca and find a place in between to stay for one night (perhaps Ambato), I’d like to drop the car off in Cuenca and fly back to Quito. I’m traveling by myself though so a little leery about commiting to this idea yet. Now that I’ve read your blog I’m interesting in the car option even more! What about Riobamba?! This is such a paradise for mountains lovers. I totally think a place to visit is Playa Santa Marianita near Manta. It is kind of a hidden treasure. Especially if you like a non-touristy and real local experience. It is very relaxing, barely any tourist (on weekends some Ecuadorian folks). As a bonus: the wind is perfect for kitesurfing or learning how to kitesurf. Personally, I think the best place to stay is in a bamboo hostel on top of the hill overviewing the beach. The local owner and his Belgium girlfriend are just great hosts. I’m already here over a month. I’m so relaxed even though I go kitesurfing every day. Hi, where is the photo below The Ecuadorian Amazon, its amazing!